Paklenica National Park is located slightly inland from the coast of North Dalmatia, situated about 47km north (northeast) from Zadar. The nearest coastal town to the park is Starigrad Paklenica. The Park is south of the Velebit range of mountains (the largest in Croatia) and covers an area of just under 100 square km. It had a mixture of high peaks with stunning views, deep gorges and beech and pine forests. The Park is an ideal place to visit for the adventurous – there are several challenging hiking trails, and climbing is also popular here. For those who like things a little more laid-back, there’s more gentle walks available too, with just as much to explore. The nearest airport to the park is Zadar Airport, which is about 47km away from the Park. Transfer (by bus) to Zadar Bus Station, and then take a bus from there to Starigrad Paklenica. Buses to Starigrad Paklenica from other parts of Croatia (Rijeka, Zagreb and so on) also exist – specifically, buses that travel the coastline from Rijeka south to Dalmatia usually stop here. See our Bus Travel in Croatia page to look up timetables on various bus company and bus station websites. 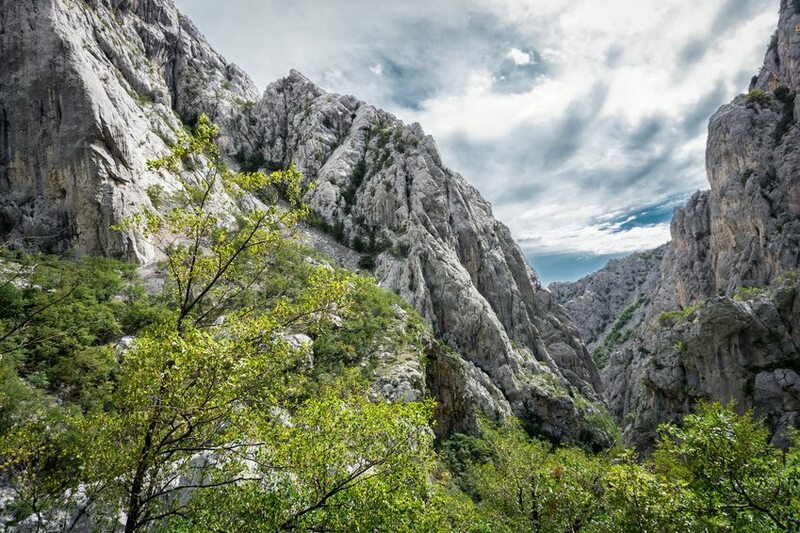 Paklenica is well known for its two canyons, Velika Paklenica and Mala Paklenica. (Big and small Paklenica!) Velika Paklenica is 14km long and between 500 to 800m wide. Mala Paklenica is, unsurprisingly, smaller but is still 12km long and between 400 to 500m wide. The Park’s highest peak is Vaganski vrh, which is 1,757 metres high. 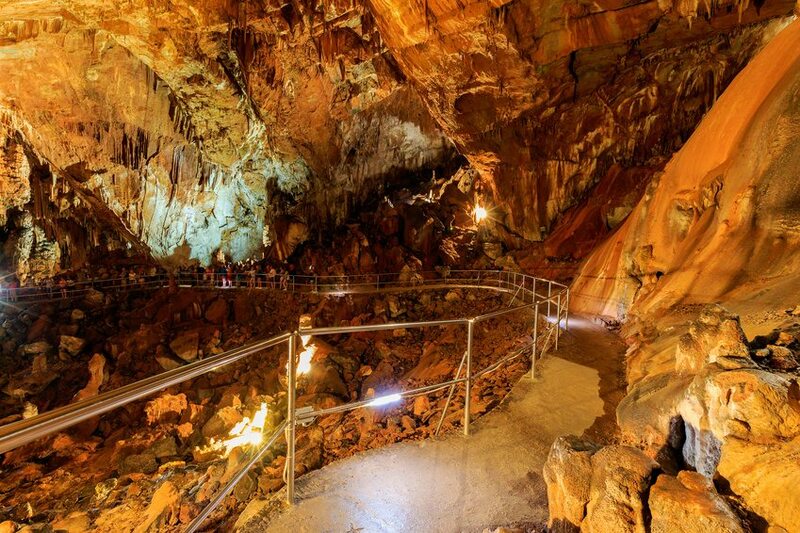 A number of caves also exist in the National Park of various sizes, one of which you can visit (see below). The Park is well known for its numerous geological highlights, and contains a wide range of plant and animal species. Amongst the wildlife in the park are various types of bird (including falcons, eagles and owls). There are also deer, bears, foxes, wild cats, and lynx. The Park is very suitable for hiking, and a number of trails of different difficulty and length exist. Hiking is probably the best way to explore and really get a feel for the Park. If you’d prefer not to go off on your own, organised excursions are available. For those who are keen to go a little faster, cycling trails are also available. For the more adventurous, climbing is a very popular activity in the Park, which draws climbers from all over Croatia and further away. Again, there are a number of climbing areas for varying levels of difficulty. Climbing in the Park is really only recommended if you’re an experienced climber, however. Of geological interest is the cave Manita pec, which can be visited between April and October on specific days from 10am to 2pm. It is possible to visit the cave every day during these hours in July, August and September. The Park does contain a few villages dotted around, although none of these have any inhabitants nowadays. There are, however, a few sights in the Park including the Marasovic Mill, a water mill that was built in the 19th century and used to serve houses in the local area, although it no longer functions today. The Marasovici Ethno House, in the abandoned village of Marasovici, is a house that has been preserved to give an idea of what life was like for residents of the area in days gone by. The Mala Paklenica Educational Centre provides visitors with information about the park, and in particular about endangered bird groups – such as owls. The campsite “National Park” is located on the coast, near the entrance to the Park. Open from March to November each year, the campsite is suitable for camping with tents or with motorhomes/caravans. There are also lodges and shelters within the Park, the largest of which is the Paklenica Mountain Hut which has about 50 beds. Facilities in these are rather basic – bringing some kind of camping gear such as a sleeping bag and blankets is advisable – but it’s a great way of truly experiencing the National Park. Hotels in nearby Starigrad Paklenica include Hotel Vicko and Hotel Rajna. There’s a wealth of information on the National Park’s official website. We would recommend you take a look if you plan on doing any hiking or climbing in the Park.